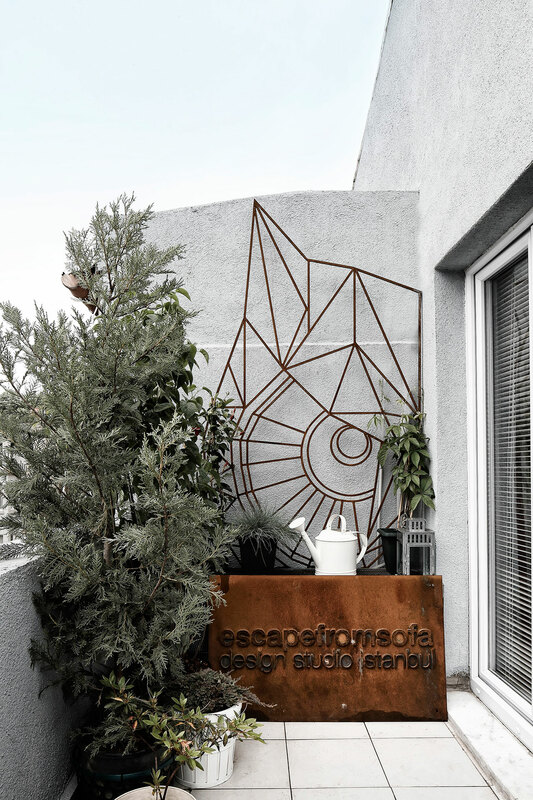 As they say "Good things come in small packages," and this 41 square metre rooftop apartment in Istanbul's lively Cihangir neighborhood certainly seems to affirm just that. Completed by the Istanbul-based design studio, Escapefromsofa, in 2014 using a Swiss Army Knife ethos that capitalizes on inventiveness and ingenuity both in front and behind "the scenes", a rich tonal-color palette of deep browns, grainy grays, white and black sets the mood while the same dark hardwood floor used throughout createsing a seamless visual effect that ties the entire space together. The midcentury modern furniture used in the apartment's décor isn't heavy and promotes a feeling of uncluttered lightness, i.e. 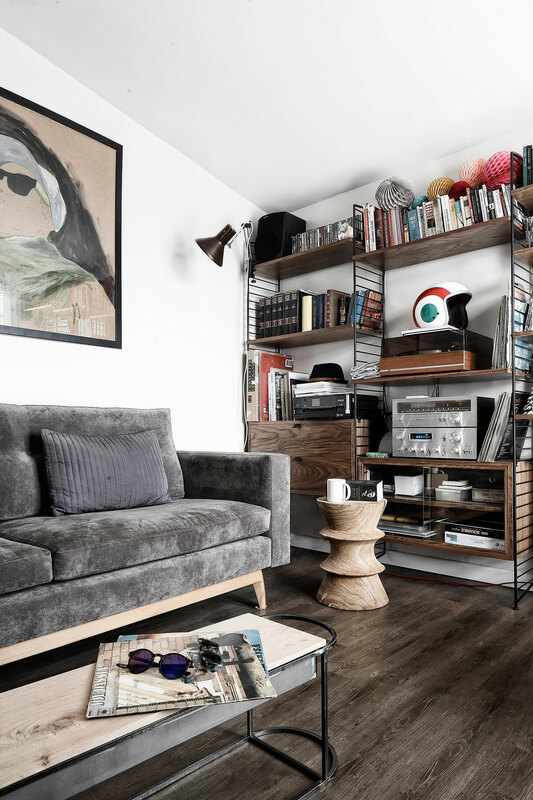 the dark gray velvet sofa is on wood legs, as is the leather and wood chair while the practical, multiple shelving unit in the living room is made up of wood planks on a simple black metal frame. 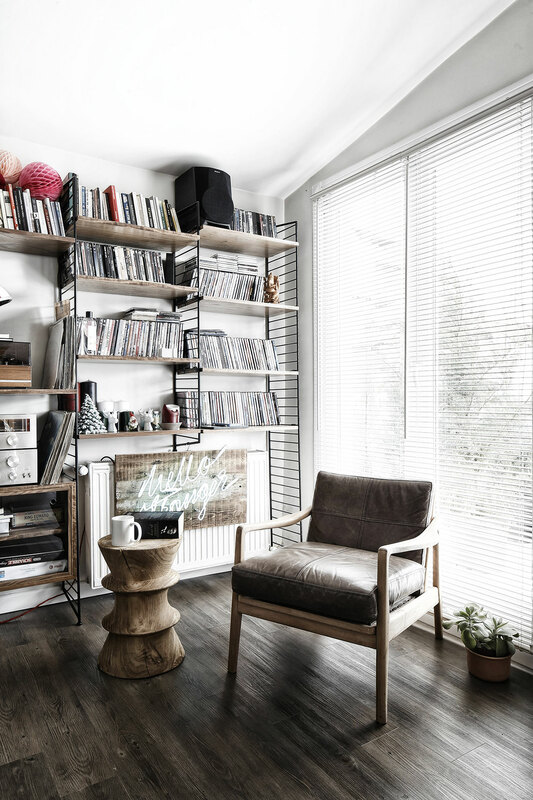 The most solid-looking items in the entire apartment are the light-wood cabinet with glass doors - which functions as both décor and a storage element - on one side of the living area, and the small wooden, drum tables in the living room and bedroom – which, if needed, can also function as stools. 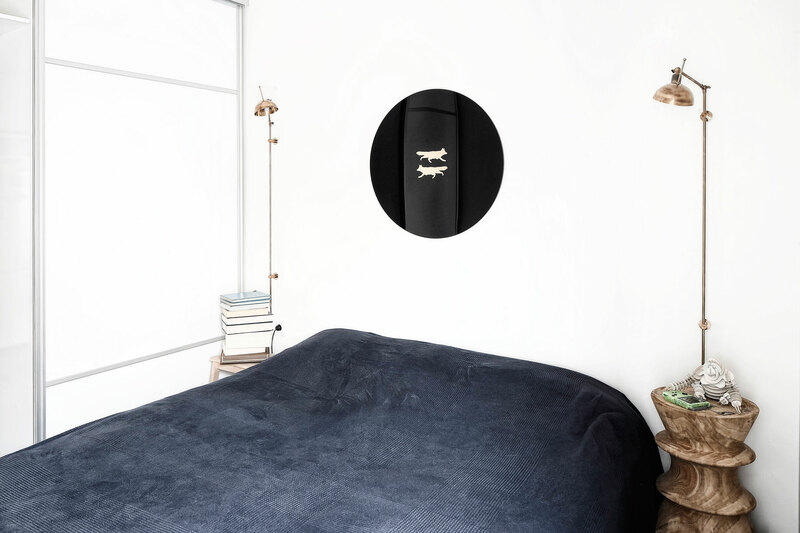 The bedroom is also all about functionality, its minimal décor consisting basically of just a simple bed, allowing for the construction of hidden closet space on either side of the bedroom doorway. The midcentury modern furniture used in the apartment's promotes a feeling of uncluttered lightness. 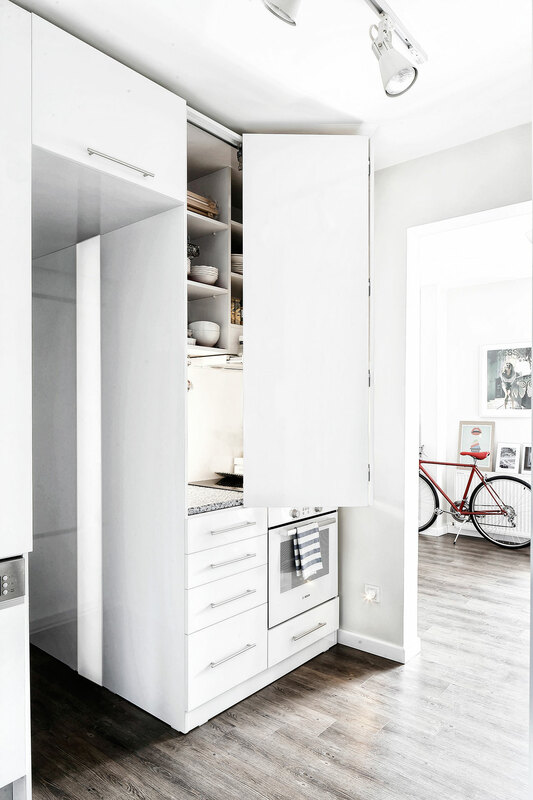 The kitchen illustrates the Swiss Army Knife design aesthetic the designers employed with countertops and appliances ingeniously concealed behind retractable or foldable white cabinets. 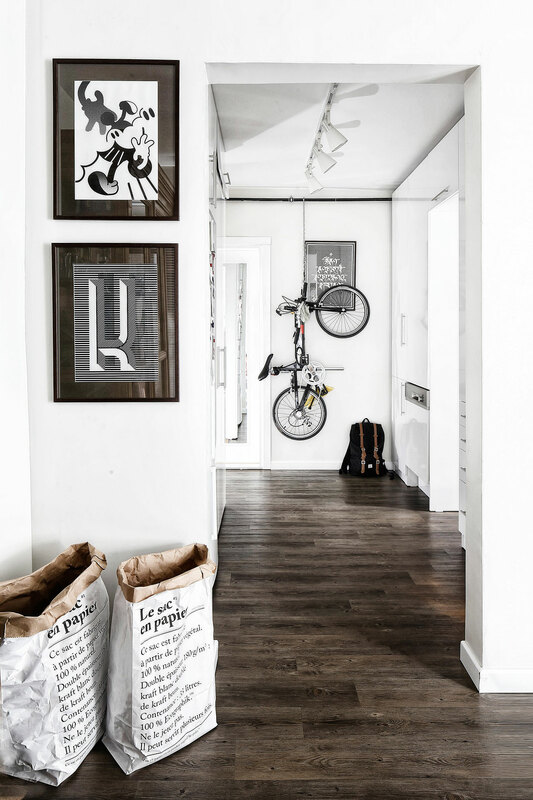 The apartment also boasts other clever storage solutions throughout - such as bike racks on the walls - thus preserving the uncluttered feeling and yet assuring that the residents lack for no city dwelling amenities. 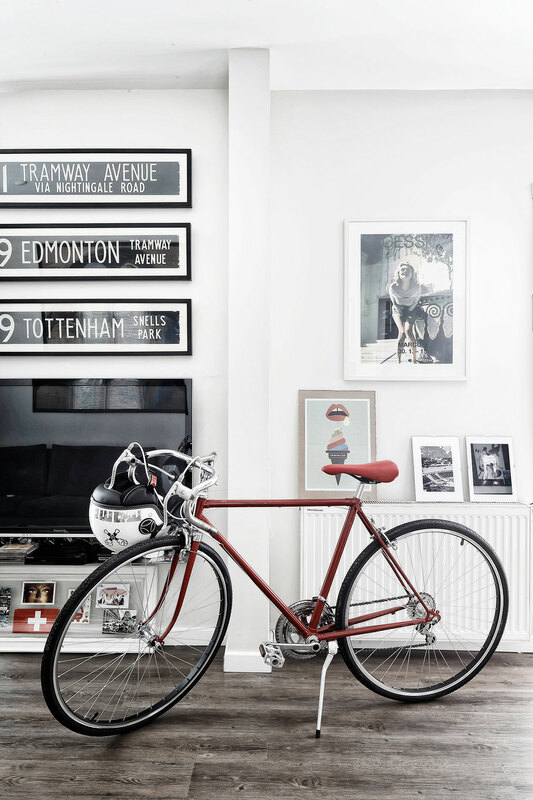 Any décor element that could be considered as merely superfluous, such as the framed posters and photographs that hang on the walls don't take up any space and manage to infuse the small apartment with splashes of color and added texture. There are no curtains on the large windows in any of the rooms, but simple, white blinds which amplify the sunlight - since this apartment is located on the roof of the building there's plenty! 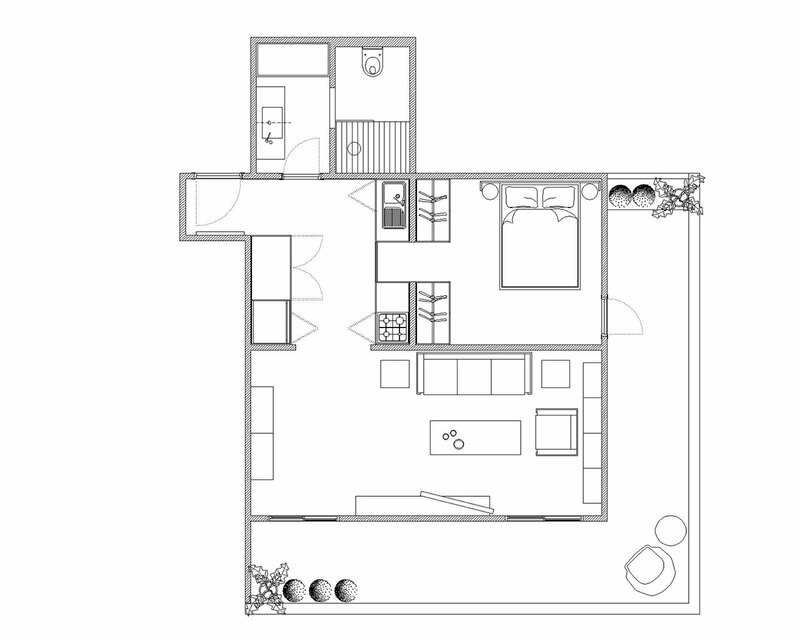 Meanwhile, the large 21 square metre veranda which wraps around the apartment from corner to corner, functions as another room, enlarging the living space over the sprawling city below. Potted plants add natural texture against the urban geometry of the view and generously amplify the indoor/outdoor lifestyle that the veranda affords the apartment's residents.